Well, we did it! We confidently rode down centerline in our best collected trot, performed a respectable Second Level test, and then collapsed with exhaustion after the final halt and salute. We can now officially say that we have entered the ranks of Second Level horses and riders, right? The test was not bobble free, but the judge commented that we did a fine job for our debut and that we are on the right track with our training. 2) With a few tweaks, we can easily boost our score another 3-4%. Of course, those tweaks aren’t overnight fixes. 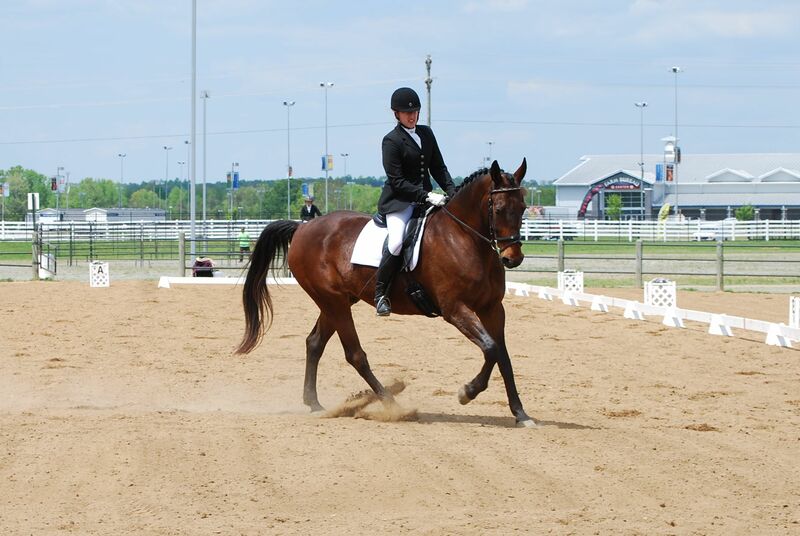 We need a better medium trot and medium canter. We need to show a better change on our comebacks from the medium gaits. We need to eliminate the trot steps into and out of our simple changes. The judge was kind enough to offer some training exercises to help us with each of these. Smaller canter loops and circles will help maintain engagement to teach the simple changes. Train the medium gaits using shorter distances. We’d better get busy since we are going to try this test again in June. 3) Breathing is very important. I am pretty sure that I did take a breath or two during this ride, but I really need to practice my yoga breathing while in sitting trot. I also need to remember to relax my arms and shoulders. Much like the simple tweaks in our work, it is easier said than done. I’m hoping that it will get better with my next Second Level ride since I’ve now got my initial fears behind me (LOL). 4) The new saddle was a good, albeit expensive, investment. The hybrid foam/wool flocking innards and design of the saddle make sitting Ike’s trot much easier for me. Even more importantly, Ike is more relaxed over his topline with the new saddle. I am still hyperventilating over the cost and hope that I can get 9-10 years out of this one like I did for my last saddle. In case you are wondering, the judge gave us a 64.545% for that test, and I have never been so excited to get back a score sheet. I rarely save my dressage tests once the competition year is over, but I do secretly hoard the one’s that have the most meaning to me. I do believe I will be saving this one. My flower beds are abloom, the lilac bush’s fragrance perfumes the side yard, Ike is in the final throes of shedding, and show season has kicked into high gear. It has already been over two months since the forced halt in riding due to the wretched February weather. Soon enough we will start complaining about sweat in our eyes and getting buzzed by horse flies. But for now we are enjoying the warmer and sunnier spring days whilst wiping away the yellow pollen that coats everything. We now have one schooling show and one licensed show in the books. I am thrilled with where Ike and I are in our First Level work. 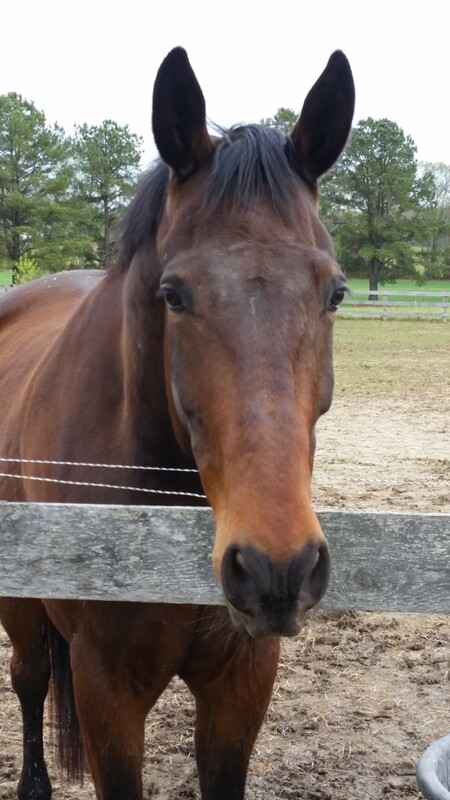 Is there still work to do on our trot lengthenings? You bet, but so many of the things that plagued us all last season are now garnering solid scores. Our canter work last year was still one part Scooby Doo and one part young dressage horse. We can now canter respectable 15 meter circles, show a canter lengthening and a come back, and best of all, the shallow canter loops no longer include flying changes or breaking into trot. Here is our First Level Test 3 ride from Sunday. It earned us our best Test 3 score to date at a licensed show. My most exciting news from the licensed show last weekend is that we now have our second First Level qualifying score for the Regional Finals in October. That is a huge monkey off my back which means that we can now concentrate our efforts towards our Second Level debut. 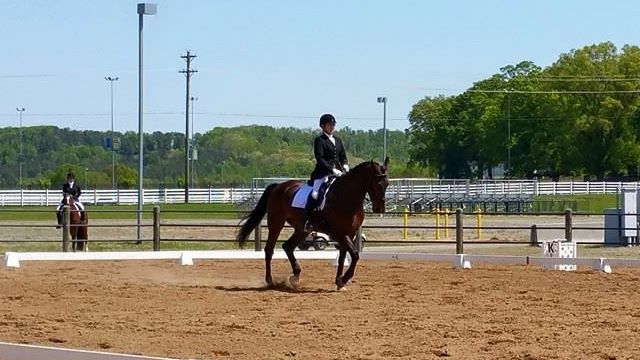 And speaking of our debut, I committed us to riding Second Level Test 1 at a schooling show on May 24th. Yikes! 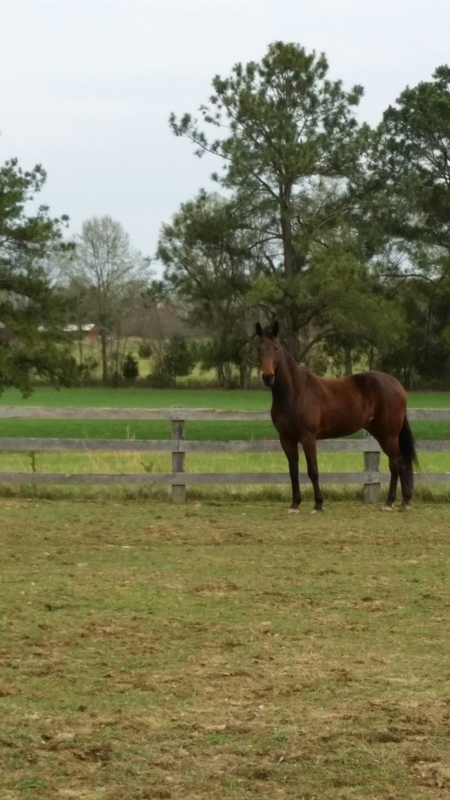 We are now on a tight schedule to improve our simple changes, counter canter, 10 meter canter circles, and our collected gaits. Oh. My. Is that all?!?!! Am I certain that we will have a mistake-free test? Nope, but at some point, you just have to take a deep breath and give it a go. If we score in the low 50’s, we know that we have more work to do before trying Second Level at a licensed show. If we can hit the 60th percentile, then we know we are on the right track. Our lesson yesterday was fairly intense given our timeline and the work that needs to be accomplished; we have another one scheduled for Saturday. We practiced pieces and parts of Test 1. If I can establish a balanced collected trot, then we can actually make it through the first 9 movements of the test with very little drama. When Ike’s alignment is right, he can rock his shoulder in…if I am off in my aids and Ike’s trot gets choppy, it is more of a “neck in.” But once we get past the free walk, all bets are off on how the test will go. Five simple changes means 5 places to pick up the wrong lead, look like a giraffe in our canter-to-walk transitions, and 5 places for a mental breakdown by the rider or horse. Breathe in, breathe out, move on. The work is physically and mentally harder now, so Ike tends to get a bit stressed and on the muscle. He then turns into a sweaty worm that squirms with even the slightest movement of my leg or weight. More breathing. More exhaling. Less tension for me is key. Easier said than done, but even more necessary. This is not the time for me to get emotional while in the saddle. Stay calm, wait out the “worminess” and then get back to work. I keep reminding myself that progressing up the levels is more of a marathon than a sprint. There is no Olympic team medal riding on this performance. There is no prize for being the fastest to get to or succeed at any given level. We will take the time to do it correctly. Success will come when the time is right. Happy, happy birthday to my big man. It is hard to believe that he is already 7. I still remember the gangly 3 year old that stepped of the trailer after his 2 day drive from Florida. It has been an amazing journey so far and I cannot wait to see what the future holds.